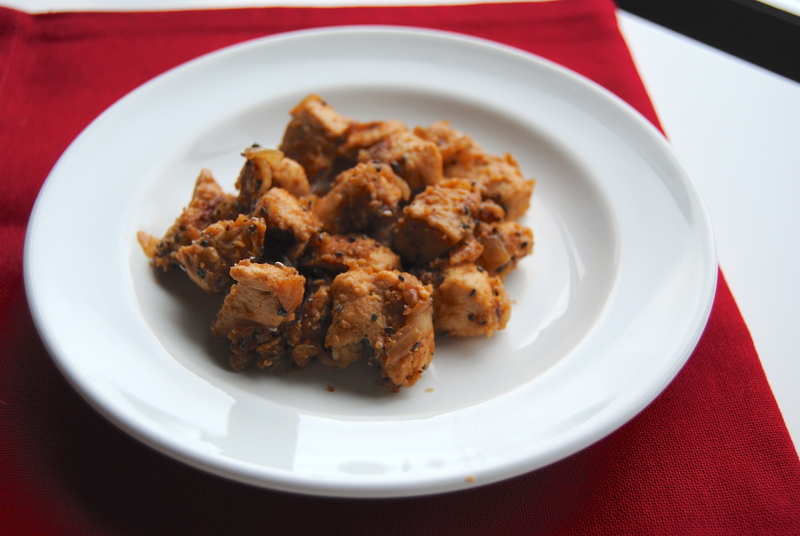 I promised you the other day that I’d be sharing one of my favorite recipes. If you know anything about me then you know I’m obsessed with two foods: bread & garlic. Theres tons of garlic in this recipe, so it’s a no brainer that I love it. If I thought I could eat garlic straight and have it be socially acceptable… I would. This is a dish my mom makes almost every time I come home. It’s one of those comfort foods that makes me think of home… along with steak and baked potatoes (ughhh I’m drooling just thinking about it). I made a couple tweaks to her recipe, mainly because I couldn’t remember exactly how she makes it… But I think I came pretty close. There are several things I really love about this dish. The first thing I love is that there are only 6 ingredients, and I always have them on hand in my kitchen. I’d imagine (because I live in a world where everyone keeps 32 oz jars of minced garlic in their fridge, obviously) that the only thing you’d need to purchase would be the chia seeds. If I’m being honest, you don’t need the chia seeds either. They won’t make or break this dish. They were an addition that I made just to make it healthier. I learned about chia seeds from my friend Erin, and I’ve been throwing them in my food/drinks ever since. The main thing I love about them is that they provide a great source of Omega 3 fats (I hate most fish so this is a big bonus) and they help you feel fuller quicker because they expand in size when they come in contact with liquids. So like I said, you don’t need the seeds for this dish, they don’t add any flavor… however, they do add a crunch texture I really like with the chicken. Oh yeah, I showed that pan… This is what my life has come to: taunting and heckling dishes and battling them with soapy water… I need a new hobby. Maybe I’ll learn to knit or something. I already act like a 90 year old woman. Any one want a Werther’s Original? I’ve got 100 in my bag. It’s not my fault that I can bribe my boyfriend into loving me by constantly carrying Werther’s around…he’s like a child… it’s so easy to keep him around. Love you babe! (see that’ll keep him content for like the next month, not that I’m much better… all he has to do is call me “beautiful” and I swoon for like the next year and a half. Besides, all my friends make fun of me and then EAT the candy. Think about that one. They wish they were 90 year old women. They also all love this chicken… at least my mom’s version, we’ll see about mine. 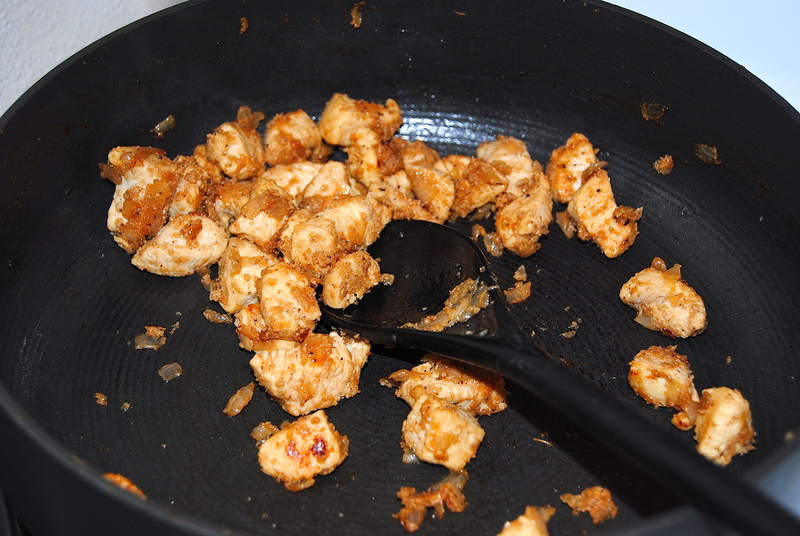 Dice the chicken breasts into bite sized pieces and throw them into a frying pan with the minced garlic. Mince the onion and add it to the frying pan as well. Add as much (or as little) black pepper as you’d like (I used fresh cracked black pepper because thats what I like). With all of the ingredients in the pan, turn the burner on to medium heat. Cook the chicken pieces, mixing the ingredients, until the chicken turns white (approximately 5-10 minutes, depending on the size of your pieces). Add the olive oil to the frying pan and cook until the outsides have crisped up (approximately 5 more minutes). Add the chia seeds into the frying pan and mix to coat the pieces as evenly as possible. Aww you’re so sweet Ani :) I stalk you and and Milan like its nobody’s business, too adorable! Miss you, can we get together next time I’m home? We just started using chia seeds, it has great benefits. We usually add it in our salads it’s a good idea garnishing it too in the main dish.